Jane, known for a few years as Issa, has worked with such luminaries as Brian Eno, Patty Larkin, Joe Jackson, Darol Anger, Peter Gabriel, and the Indigo Girls. Her haunting duet with k.d. lang, “Calling All Angels,” was featured on the soundtrack of Wim Wenders’ film, Until the End of the World, and also on the soundtrack of Pay It Forward. She’s released more than 20 albums and published two books of prose-poems. “I believe music is a privilege,” she says. “I feel very lucky to call myself a musician. It is one of the ways we can stay connected to our deepest selves. 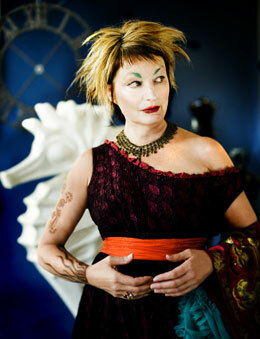 Not knowing quite what to do, I am using the principles of music as my guide, my training being in harmony.” For an evening of harmony, beauty, and uncertainty, let Jane Siberry guide you to the edge – and beyond.